Missing or Broken-down Tooth That Needs Replacing? Our doctors recommend dental implants to replace individual teeth. 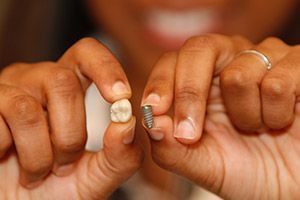 A dental implant will not affect your adjacent teeth. It is better to place an implant rather than leave a space missing, as this keeps the other teeth from shifting to fill the empty space. 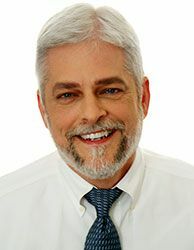 For a missing tooth or a broken-down tooth that needs to be extracted, Dr. Schmidt and Dr. Lee can expertly place a dental implant and top it with a durable and natural-looking dental crown. Due to recent technical advances in dentistry, most patients are now eligible to receive dental implants. A bridge requires the grinding down of the adjacent teeth, whereas a dental implant does not affect the teeth next to it. An implant-supported crown is a stronger solution than a dental bridge for replacing a tooth. Traditional dental bridges require the grinding down of adjacent teeth, which severely weakens those teeth and can lead to complications such as fracture, decay or tooth failure over time. Bridges also have an average life span of about ten years. Implant-supported replacement teeth can last a lifetime, if cared for properly. 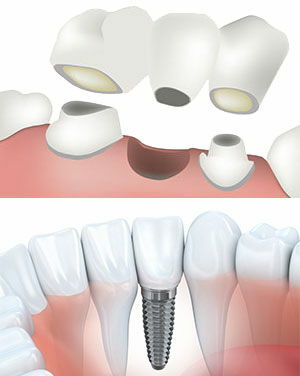 Implants have many advantages that make them superior to all other forms of tooth replacement. Learn more about the benefits and advantages of dental implants. Your replacement tooth is made by a master lab technician who will ensure the tooth looks beautiful and natural. Our doctors will fabricate your replacement tooth from top-quality porcelain that is durable and natural-looking. They use a state-of-the-art 3D digital scanner to get accurate impressions of the top of the implant and the surrounding teeth. They ensure the shading and shape matches your surrounding teeth. 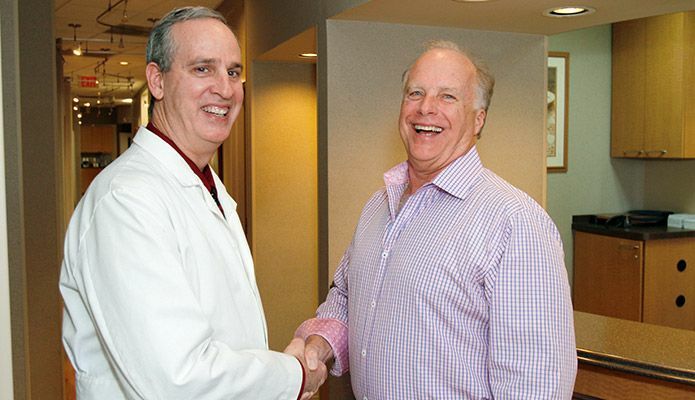 The tooth attached to the implant is made by the best labs around, and the doctors work with a master lab technician who helps ensure the tooth looks beautiful and fully natural. 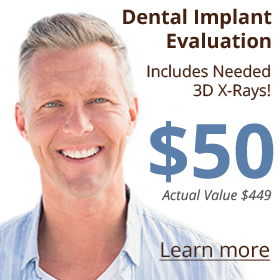 Advanced technology, like our 3D scanner, ensure your implant treatment is precise and minimally invasive. 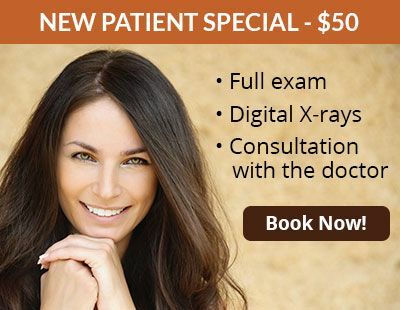 Our doctors use the latest technology to make implant placement a very precise procedure that requires little to no cutting or suturing and causes very little stress on the body. Single implants can be placed in a short appointment, using only local anesthesia. Most of the work is done before the implant is placed. 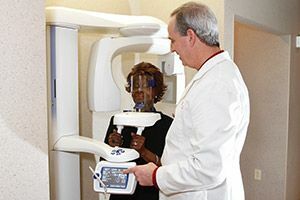 Our doctors use a high-tech system of 3D imaging (3D X-rays) to capture images of the patient’s teeth and jaw area. These images are relayed to special 3D software, which is used to manipulate the images in a 360-degree view. The doctors can plan the exact position and angle of the implant placement and any needed bone grafting, all ahead of time. If a tooth has to be extracted, the implant can be placed right away and can, in most cases, immediately be topped by a dental crown. Patients with a long-term missing tooth or soft bone sometimes require some bone grafting and a period of waiting time. This allows the implant to integrate fully into the bone before a functional crown is placed. Under these circumstances, if the implant is in a visible area of your smile, the doctor will provide a temporary cosmetic tooth that preserves your appearance while putting no pressure on the implant as it heals.